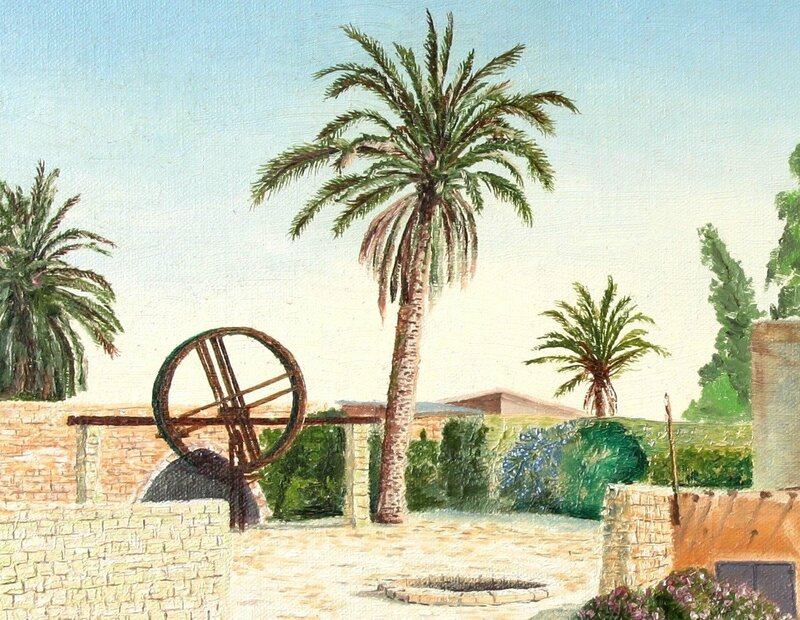 The artist visited this site, Abraham’s Well at Bethsheba (Bethsheva) Israel, on the Northern edge of the Sinai dessert, Israel in 1983 yet today none of his Israeli friends recognizance the place. To put it mildly Israel has changed, developed hugely, miraculously since 1983. 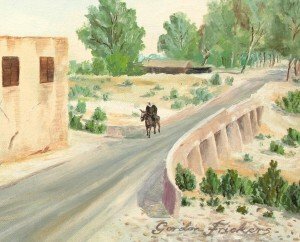 This painting is a good example of how biblical prophecies of the desert blooming have come try in our lifetime. A miracle? You could call it that; a miracle with a lot of sweat, brains and blood behind it. That makes this and the other paintings in this series all the more special, recording through the sensitive eyes and hands of an artist, Israel in the process of transformation from the sparsely populated arid desert and ruin, neglected for centuries into a modern vibrant start up nation a light and inspiration to others. Gordon Frickers writes, “We have yet another mystery here. I have been unable to find my notes made 25 years ago. If you know this place and it’s history, do contact us and help record the background story to this historic place”.